But the TV promos are just the beginning. As MSNBC President Phil Griffin explained, this two-and-a-half year plan will help to broaden the reach of MSNBC as a whole. Starting next Tuesday, the commercials will be shown on MSNBC, but more important, they will also be shown on NBC Universal’s other channels, and on outside channels as well. In addition, ads will appear at train stations, bus shelters and phone kiosks in the Northeast; in newspapers, including The New York Times; and on Slate, The Daily Beast and other Web sites. “It’s a niche world out there, but we’re going to own this world and ‘Lean Forward’ is going to be the lens by which we own it,” said Griffin. 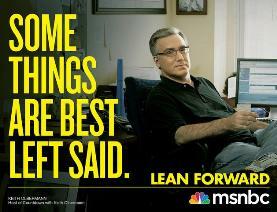 “The Place For Politics” will remain a slogan for the network, but “Lean Forward” will be the main brand. The sleek campaign, while winking at the idea of progressivism, has been mostly about unity and patriotism so far. If it can have the same mainstream impact as “Fair and Balanced,” it will have achieved its goal.